There may be some quid pro quo going on between Mel Gibson and Mark Wahlberg. Just yesterday we learned of Gibson's next directing gig, the WWII Naval film Destroyer. But in that story was also news that his Daddy's Home 2 co-star had pushed for Gibson to be added to The Six Billion Dollar Man cast. Now Gibson is returning the favor. 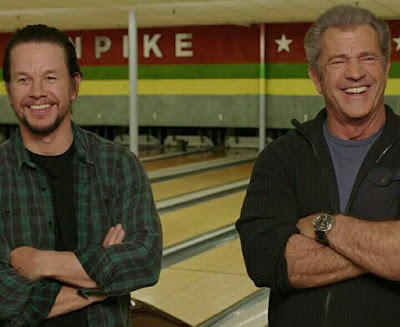 The Wrap says Gibson wants Wahlberg to star in Destroyer, which centers on the 1945 Battle of Okinawa and the USS Laffey, which withstood the most devastating kamikaze attack in military history, earning it the nickname "The Ship That Would Not Die." Gibson's friend Rosalind Ross wrote the script, adapted from John Wukovits' book Hell From the Heavens: The Epic Story of the USS Laffey and World War II’s Greatest Kamikaze Attack. After being a pariah in Hollywood for years I guess it's good to see Gibson making friends again? The Six Billion Dollar Man would be first up as it's due to open on May 31st 2019.